As to where the news is..
What would be good news sources for a networked society that has different priorities than the old fashioned media? An oldfashioned newspaper or TV station would have a line in with the frontline for various kinds of news. There'll be somebody listening to the police radio channels. There'll be somebody at the government capitol, or the local town hall, trying to keep up with the issues that pass through. Somebody watches and analyzes the stock market. Somebody will be monitoring the major cases in the court house. There will be a helicopter that can go where some action is reported and get video from the air. There will be reporters sent out to war zones, catastrophe areas, and that kind of thing. Plus if that particular news organization doesn't have the resources itself, it will get wires from bigger news organizations that do it. But even with all of that, journalists are busy, and they often need to have a story today or tomorrow. So very often they're merely passing on what somebody else said or wrote. Their story might simply be the summary of some report somebody did. It might be a rewrite of somebody's press release. The key points of somebody's book. An interview with somebody who seems to know what is going on. Probably only rarely is there time or interest in actually getting to the bottom of what is going on, or double-checking everything. So the mosaic of a certain general image is being presented, even though it might not really be the truth, or the most important things to know. Just because everybody's flocking to roughly the same sources. So, say you were a blogger, who wanted to write about interesting things going on, and you wanted more primary sources, to maybe discover a different picture than what you were fed, where would you go? Do you know the difference between primary sources and secondary and tertiary? Let's say there is something going on somewhere. A tsunami, a war. You'd want to hear from the local people who're there. The locals, the people on the ground, the people who're plugged into the action. And, indeed, if people like that have blogs, that's some of the most interesting stuff. Salam Pax, an Iraqi inside Iraq before the invasion. 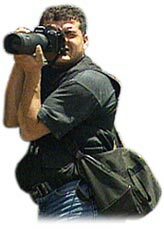 Kevin Sites, photo journalist in Iraq. Back when NATO was bombing Yugoslavia it made a big impression on me that I could chat online with a friend in Beograd, in-between the bombing raids and power failures. You usually get a very different story than what appears in the normal media. But how do you find these people when you're looking? Maybe there will just be enough bloggers that you'll always be able to get the real story from the ground, I don't know. Or maybe others will find such stories interesting enough that they'll be passed on to you somehow. But it might be nice with a more organized way of finding a local voice in some particular area. A problem with a lot of news is that it is a little haphazard what you'll hear, and you might not get any follow-up at all. Like, somebody might write an article about some promising new discovery or invention. And very often, that's all you'll ever hear about it. Nobody wrote an article as a follow-up, a year later, telling you what actually happened. Somebody invented super-cheap solar cells, discovered the ruins of Atlantis, or whatever. Sounds very interesting. And then you never hear about it again. I want to hear what didn't work out about it. They were mistaken, they didn't get funding - what happened? And the trouble is that that's very hard to find out if nobody wrote an article about it. Or unless I had a lot of time on my hand to research it and call people and try to find out. I certainly couldn't do that with everything I might be interested in. But a network of people could, if there were an organized way of remembering open issues. Statistical data can be a source of news, if you have enough of it. You could find out what is better, what is worse, which trends seem to be related to each other, etc. That is, if you had access to the data in a fairly consistent and timely manner. It shouldn't be hard for you to check for yourself how it is going with global warming, whether the economy is better or worse, how different parts of the world are doing. But it is, for some reason. I don't know anybody doing that. We seem content just reading an article about some several year old statistical report, telling us what it means. I'm sure there are all sorts of issues involved in gathering and normalizing data, but it really shouldn't be unthinkable that I could look for myself. Maybe I can and I just haven't plugged into the right places. I mean, people who're into stock markets will watch all sorts of stats continually. Consumer price indexes, unemployment rates, from month to month. They just don't seem to produce the kind of data I'd find interesting. There are all sorts of people who're at the forefront of something interesting happening. Scientists, explorers, activists, aid workers, government officials. Should I hope for that they'll all have blogs and that they'll give us the straight dope about what is going on? Maybe. Blogging gives a lot of reasons to hope for hearing the truth more often. But, still, a lot of people who do important things are too busy to chat about it. Or they're in organizations that don't believe in sharing it freely. Or they're in a system where what they're doing will have to be peer reviewed and published before it is mentioned publically. Really, I'm just looking for what channels I should be listening on, to get what's really worth knowing, that's new and enlightening and constructive. It is still a bit of a toss up, whether I'll miss it or not. The possibilities for accessing more primary sources are advancing. But so are the possibilities for painting phoney virtual realities. Or maybe the answer is to make one's own news. Instead of flipping through the channels, trying to figure out what is going on, make your own channel. Make something worthwhile happen, and report on it. The best way of predicting the future is to create it. The world is waiting for you and I to do our part. Pneumonia can sneak up on elderly pelope and wreak life-threatening havoc before family members recognize the need for hospital care, warns Nabin Sapkota, M.D., a hospitalist in Nebraska. A tragedy around Pakistan is constantly on the worsen when relief resources and guide fall far wanting what is called for. More guide is frantically needed as being the potential for scores of fatalities takes place to loom.